Memorial Stone, hewn from the aqueduct quarry in upstate NY by the members of the First Provisional Regiment and placed at a site purchased by William Rockefeller for the burial of those members of the Regiment that were homeless or did not otherwise have a place to be buried. PVT Frank DeCosta, New York Guard is buried there, who died of the Spanish Flu while on duty guarding the Aqueduct. SLEEPY HOLLOW A stone monument here at the at the Sleepy Hollow Cemetery commemorates some of New York’s fallen heroes of World War I, but they are unlike any other Soldier killed in France during the war. The names recall 32 members of the New York Guard’s First Provisional Regiment who perished during the 1918 Spanish Influenza pandemic while serving the homefront. Members of the New York Guard and New York City Department of Environmental Police officers participated in the 97th Aqueduct Defense Memorial Service, Honoring those First Provisional Regiment volunteers here May 7. The ceremony, supported by the 56th Brigade and New York Guard Headquarters element, honors the World War One service of those who died protecting their home. “The main purpose of the memorial ceremony is to render honors to the memory of the dedicated men of the First Provisional Regiment, New York Guard who made the ultimate sacrice to protect the New York City Reservoir System during World War One, and second to remember our comrades in arms who have passed on in the previous year,” said Col. David Warager, the New York Guard commander of Recruiting, Retention and Public Affairs. More than 8,000 New Yorkers served in the 1st Provisional Regiment, the lineage of today’s New York Guard. Following the mobilization of the New York National Guard for service in France in 1917, the regiment was formed to protect the state’s aqueduct system from feared German sabotage. Forty guardsmen perished performing this homeland defense duty. Sleepy Hollow is the final resting place of Frank De Costa, a member of the New York Guard who died of pneumonia in December 1918. 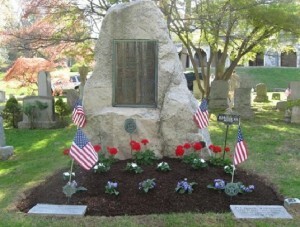 When he learned that the family had no means of a proper burial, William Rockefeller, the son of business tycoon John D. Rockefeller, donated a burial plot at Sleepy Hollow and the site become the central location for honoring the service of the entire regiment. A memorial boulder was removed from Bonticou Crag in Ulster County’s Shawangunk Mountains, part of the vast area of aqueduct the Guardsmen defended to Sleepy Hollow to permanently honor their service and sacrifice in 1919. Words of reflection were offered by Sleepy Hollow Mayor Ken Wray and DEP Police Chief Peter Fusco following the placement of memorial wreaths. Following the official comments, and the reciting of the roll call of honor by Chaplain (Maj.) Sean Gardner, the New York Guard Command Chaplain, the 56th Brigade attendees then rendered honors with a 21-gun-salute and the playing of Taps by Capt. Brian Kanner.